← Jesus, why you gotta be like that? 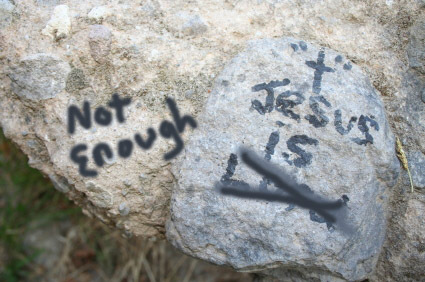 I wish Jesus was enough for me. In Africa, Christians may walk hours to get to church. In America Christians stop attending because the pastor preaches too long. Weird. In India, a group of Christians is brutally murdered and the church meets secretly. In America, people whine if it’s too hot and stay home if their church has no AC. In Romania, believers gather in a very simple church and sing praises along with a struggling guitar player. In America, a couple years ago I had a member of our church ask for a music schedule so he could skip when a certain group led. In China, believers gather for baptisms under the cover of darkness. In America, I recently listened to several people complain that we baptized too many teenagers in a service and took too much time. In Central America, neighbors are bringing neighbors to Jesus with excitement. In America, we pay outreach pastors and purchase direct mail marketing lists. In Haiti, the church sings hymns amid the rubble and decay. In America we debate format and fight about theology amidst our invisible rubble. In America we sit alone at home listening to pod-casts on our iPhones while believers gather to celebrate and praise just around the corner. We get blessed by a well-produced message but we don’t have the opportunity to bless or encourage anyone else except maybe the dog snuggling up to us on the couch. What are we doing, church? Why are we squabbling and elevating our own desires above those of others? When I look at the church worldwide and see it meeting with no fancy projectors, no comfortable theater chairs with cup holders in the armrests, no Line6 amps cranking Gibson guitars and no robed choirs swaying to hundred thousand dollar organs, I wonder how it manages. It meets in cinder-block rooms, tents or under thatched roof sunshades and sits on dirt floors. All they have is Jesus. And, for them, Jesus is enough. I wish Jesus were enough for me. I wish I cared less about my agenda and more about His. I want to be blessed by the heart of the less-skilled musician and thankfully receive his gift to me. I want to receive the gift of the less-than-dynamic teacher sharing what he discovered in God’s Word this week. I want to be excited to unwrap the gift of that missionary home on furlough. I want to be like Jesus in this imperfect church I attend. I want to love His church like He does. Yes, it’s 3 AM and God is doing business with me and convicting my heart. I wish He’d do it during the day instead. He probably would if I weren’t too busy whining and complaining or listening to people whine and complain to hear Him. I bet if we truly put each others interests above our own, these 3AM chats would be replaced by peaceful, restorative sleep. This entry was posted in Christianity, church planting, discouragement, Find God, Jesus, leadership, love, pastor. Bookmark the permalink. 2 Responses to I wish Jesus was enough for me. Jones is right, great perspective. I have no way to relate from your vantage point as a pastor, but as someone that has been involved (and continues to be) in ministry, I have to constantly pray for clarity in order to see Jesus in every thing. Another great post Scott, keep it up. Great perspective! Sometimes, it’s hard to believe that the church I see is the same church I read about in Acts.